This year Thanksgiving took us a couple of hours northeast of San Diego to a cabin in the charming town of Idyllwild. Since we were spending Thanksgiving in an untraditional way (at least untraditional for us!) we decided to have an untraditional dinner. Thanksgiving dinner started with freshly-baked pretzels with a slightly sweet yet tangy and savory cranberry, feta, and cream cheese dipping sauce. After our pretzel appetizer came the main course: beef braised in veal demi-glace and chocolate stout with carrots, fennel, onions, red peppers, and celery. The beef was served on top of jalapeno-havarti grits with an accompanying salad of grilled brussels sprouts and asparagus tossed with sauteed portobello mushrooms, red bell peppers, minced garlic, crispy bacon, pepita seeds, and a tangy red wine vinaigrette. Several hours after dinner, we were able to make room for a delicious pineapple upside-down coconut cake with a layer of buttercream frosting and sweetened flaked coconut on the bottom. A: weeks before thanksgiving it was suggested to me that it would be nice if we could do a simple and rustic meal rather than a big ol’ honkin’ turkey. so our dinner this past thursday was not typical of what one might think of when planning a meal for turkey day. it turned out okay though, i think. thoughts? T: I thought it was delicious. The pretzels were really really soft and tasty. They made a fantastic appetizer. And I thought the main dish was perfectly rustic, warming, and just plain scrumptious. The salad was particularly good I thought. Mmm mmm with those little pieces of bacon… that stuff was good. It was probably the farthest from a traditional thanksgiving meal that I’ve had, but I have no complaints. You? A: i agree. for the most part in the end everything turned out to be yummy. it’s always kind of frustrating using a small, unequipped, kitchen that is not your own. that was definitely true here. i kept feeling like i was f’ing everything up. anywho, i thought the pretzels turned out really well but there was definitely something different from the amish market pretzels i grew up eating… you know, the ones i was trying to reproduce. the beef braised in chocolate stout and demi-glace was good… but not quite what i was looking for when i set out making it. the jalapeno cheese grits were mega tasty. at least i didn’t mess those up! 😉 ooo, i also was really really into the salad. 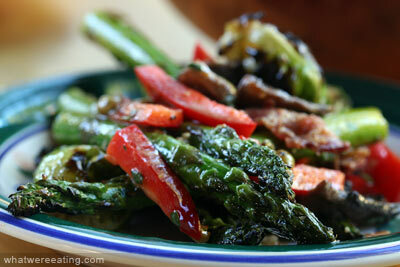 the bacon and red wine vinaigrette really set off the asparagus, portobellos, brussels sprouts and pepitas. mmm that was a good one! I’m going to have to give the meal overall a 3.99/5. it was good, really it was. i think it lost points for being so frustrating to make. i can’t hold that against the food though. if i were rating the pretzels by themselves they would get a 4.3/5 – i will definitely be making these bad boys again. The beef and grits together would get a 3.8/5 and the salad would get a 4.6/5. i don’t know why when i think of all the items together it adds up to a low score, but it does…geez! you should have shut me up about half a page ago! T: I thought you were going for a record or something. Whew, that last “statement” was more text than the rest of our conversation combined! T: well, I’m sorry that it was so frustrating for you to make… my frustration level eating it was exceptionally low. I’d give the meal as a whole a 4.65/5. 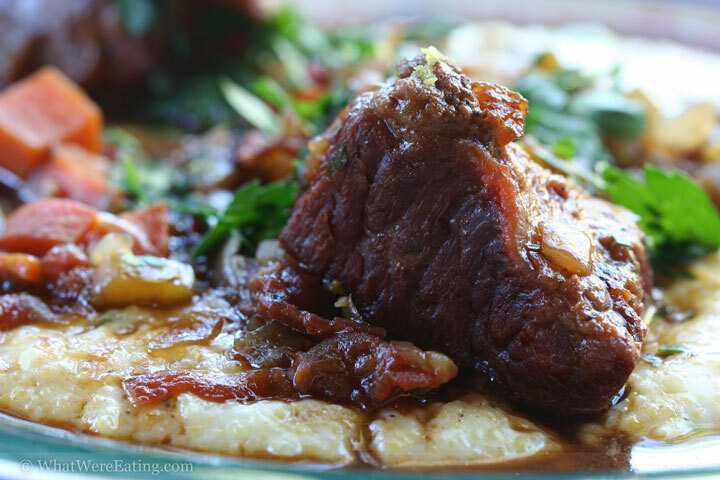 The beef and grits really hit the spot as a nourishing rustic meal, and the salad. my god that was a good salad. YUM. And, I’ve never had a real Amish pretzel, but those pretzels that you made were the best pretzels I’ve ever had. Seriously good. Yummy yum. 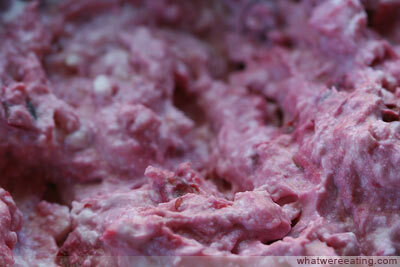 And we haven’t said anything about the cranberry/feta/cream cheese dip, but that stuff was really good as well. You gotta put up a recipe for it- it was a great twist on a classically-thanksgiving ingredient. So thank you Amanda for giving our bellies and mouths and noses something to be happy about on thanksgiving. Mmm. A: no prob bob! you know, i think my biggest regret with the thanksgiving meal being untraditional is that we don’t have a ton of leftovers to feed us for the next week! i could really go for some leftover turkey hash right about now! T: yeah, leftover turkey would be a good thing. Hmmm… we could go around begging for leftovers from our neighbors. A: ooooor we could go hit up some of the post-thanksgiving grocery sales, buy a cheapy turkey they need to get off the shelves and roast one this week! woo hoo! week-after-thanksgiving turkey here we come! 8 oz cream cheese, well softened to room temperature. Bring first 5 ingredients to a boil over medium heat, stirring frequently. Once a boil is reached, reduce heat to medium-low. Simmer until the cranberries have burst and the sauce is thick. Taste and season as necessary with kosher salt and freshly cracked black pepper. Remove from heat and allow sauce to cool for 5 minutes. Remove the rosemary sprig and sage leaves. In a mixing bowl, cream the cream cheese (stir with a wooden spoon until easy to work with and slightly fluffy). Add the feta cheese and slightly cooled cranberry sauce to the bowl. Stir until thoroughly combined. Taste and adjust seasoning as necessary with kosher salt and freshly cracked black pepper. 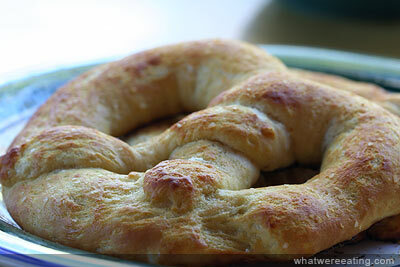 Makes a great dip for freshly baked pretzles or as a spread on bagels. Enjoy! I suppose it wouldn’t be right if I didn’t comment on the pretzel seeing as I live in Lancaster PA, amish-town USA. but somehow i think yours were better. and i know i’ve said it before but those photos are BANK! i esp. like the cheese dip. A+ yalls. I just cut up and salted about 20# of Cabbage for sauerkraut. Did you prep a lot of stuff before you went, or did you do it all there? We had a untraditional traditional Thanksgiving. Sitting on my hands until you post the braised beef recipe… I love cooking with beer! Have you ever tried a stout ice cream float or chocolate stout milkshake? Yuuuumm. That’s exactly what we did! We purchased a turkey the week after and I roasted it. We still have leftovers! It was a great idea and now I’m making lots of turkey curries. Yum! I love your site. I followed it from tastespotting and haven’t looked back since. I’ve already made several of the dishes spotlighted on here. Great stuff! Thanks for all of your wonderful recipes, pictures, and commentary. Wow, I hope the recipes are to come soon. Everything looks amazing! Please…share the Grits and Grillade. That is what brought me to this page. Or, tell me where to find it…that looks great! it’s my favorite version that i keep coming back to time and again! i hope you like it!